I have been pondering the issue of tengai, the komuso's basket hats, for awhile. People's views in Japan seem to be mixed with everything from "they are just part of a silly cosplay (costume playing) for bored old guys" to "very spiritually oriented symbols that should be upheld." I'm not realy referring to some of the claims that it helped because they were spies (which is the minority of cases I believe). I'm thinking more spiritually oriented. Dr. Lee (1986) mentions that this “signified his non-attachment to identity or ego” (130). However, to me it seems that wearing the tengai in public was an unmistakable reminder and symbol of his identity as a komuso both to the public and to himself. Likewise today, some players also decide to mark their identity and group associations by donning the komuso attire/costume. By wearing the robes and tengai, a monk was directly signifying attachment to that identity and lifestyle. These reminding symbols were powerful, with the clothing itself an impetus for the komuso to stay in his role and act in a proper way, (similar to a catholic priest, a cop, or a nurses uniform) thus ultimately defining his behavior by creating a form of structure. Certain shakuhachi schools and players today still choose to wear this tengai and perform in it. Personnally, I choose not to wear one. For maintenance of a traditional ritual and symbol I can see the necessity, however spiritually I have not come to terms with the reason of separating the spiritual world and the “mundane.” It is like saying that what lies within the tengai, ME the spiritual holy being, is better than regular society and needs to be kept separate. I believe a society would be better off if there was a better balance of nature, spirituality and the “mundane”. Just wondering people's thought on the subject. Many shakuhachi players can't really explain the point of the tengai, and historically, at least to me, it seems somewhat vague as well. Enlighten me folks! Dr. Lee (1986) mentions that this “signified his non-attachment to identity or ego” (130). However, to me it seems that wearing the tengai in public was an unmistakable reminder and symbol of his identity as a komuso both to the public and to himself. My impression from art from the period is that before the 18th century or so the tengai was really just a slightly deeper traveller's hat. You could still see the face just fine in many cases. It only becomes the really deep ego-concealing "basket" after the komuso start to get properly organized and invent the Fuke-shu at around that time. If this is true, then whatever legends were woven around it later, the basket-style tengai must have been meeting some institutional needs (spiritual and/or practical) that weren't an issue for individual wandering players. I think that Yamaguchi Masayoshi's "Shakuhachi-shi gaisetsu" goes into this a bit; that was definitely where I saw most of the art. I'll try to dig my copy out later. Yamamoto Hozan has written about his attempt at a komuso-style pilgrimage. He found the noise inside the basket unbearably loud and had to give up. He attributes this to the difference between modern flutes and Edo-period flutes, specifically the dreaded j-word. Thanks for the interest. If the thought of an identity as a komuso was important, then it is similar to a status symbol. It seems it kind of defeats the purpose of covering the face becasue it is still a symbol of attachment to a certain group identity (Fuke sect), especially when the name change also implies "priests of nothingness". Musicaly it only hinders the playing too, as Yamamoto Hozan has mentioned, but I think you were right about the different flute use, yes the dreaded j-word, as well as they were probabaly playing slower, less ornamented pieces. But I wonder as to how much of an actual spiritual reason they had for developing it into a basket when they were creating the Fuke-shu. Most of their connections to Zen are contrived anyway, is this just another one? I can certainly understand your discomfort with separating the spiritual from the mundane. One of the main points of Shingon is radical nondualism. The mundane and the spiritual are one in the same and not separate. I love that about Shingon. I guess in the end a hat is just a hat but if it represents something you don't believe in I think your choosing not to wear it is valid. "an unmistakable reminder and symbol of his identity as a komuso both to the public and to himself." It is common for dedicated practitioners of spiritual traditions to wear a "uniform". And I think that does exactly what you said. That itself can aid their training. For someone who has already attained the fruit of their training, there may be no reminder necessary. But until then, it may be very useful to one's spiritual training to have something to constantly remind you of what you are doing, of your life purpose. This can help mindfullness and attention to the training. It's pretty difficult to forget you are a komuso when you have a basket on your head, right! As for hiding the identity, of course wearing a tengai does make you stand out and makes you very obviously identifiable, but on the other hand, they are not seeing "you". They are more seeing a nameless, faceless komuso. No-one can recognise you, and no-one will remember you (as an individual). Perhaps this removal of individual identity (even if it does not remove your group identity) helps enable you in moving into a more non-personal realm, withdrawing your energy from sustaining your pretense as an individual character. This is actually an important factor in isolated meditation retreats, where, often for months or years on end the practitioner does not have to enter into the game of individuals relating to each other as particular characters. This lets certain mental/emotional habits and structures relax, or even die/dissolve. Perhaps the tengai is a way of bringing in some of that advantage of isolation, while actually being among people, in inhabited areas. Whether that can apply nowadays is another question. Komuso are so rare that you may just enhance your individuality by wearing the tengai. Also the tengai was merely a part of the whole training system, so without the actual background of being a full time Fuke-shu initiate, the tengai in isolation might not serve the same purpose. On a practical note, I have never played with a tengai on outside, but I have often been playing outside when the wind has interfered with my breath, and I wished I had a tengai to protect my air stream! I have wondered if that had anything to do with the tengai's development. If the thought of an identity as a komuso was important, then it is similar to a status symbol. It seems it kind of defeats the purpose of covering the face becasue it is still a symbol of attachment to a certain group identity (Fuke sect), especially when the name change also implies "priests of nothingness". This begs the question of whether covering the face has any value as practice, though. From that point of view you could ask the same things about playing the shakuhachi at all. Why do it if you're supposed to be a priest of "nothingness"? Why not just sit around meditating silently all day, removing yourself from the world entirely if self-effacement is your goal? Most people are comfortable with the idea that the answer is some blend of practicality (begging) and "practical spirituality" (ichion jobutsu, etc.). I see no reason to doubt that the tengai is the same way. You got the practical aspect of being able to get around and receive a certain amount of respect while remaining completely anonymous, and maybe there was a "spiritual practice" too. And it doesn't have to be about protecting the wearer from the corrupting influence of the outside world, as you seem to suggest; maybe the opposite is true, and the idea is that the wearer becomes temporarily unable to assert their individuality or impose their emotions on other people via facial expressions, thus helping them deal with and beat down their ego. "Whether that can apply nowadays is another question. Komuso are so rare that you may just enhance your individuality by wearing the tengai." It seems that given the few numbers of komuso, even in their hay day, this would have been the outcome even back then. Not that expressing our individualism is a bad thing, I'm all for it, it just seems to go against their spiritual reasons for wearing it. "Perhaps this removal of individual identity (even if it does not remove your group identity) helps enable you in moving into a more non-personal realm, withdrawing your energy from sustaining your pretense as an individual character." I understand your points Justin of it being a part of the training system, but I can't see why there is a need for a more non-personal realm to begin with? Weren't they supposed to in essence be dedicated songs for people in return for alms (during takuhatsu that is), then why is there a need for the distance between? "And it doesn't have to be about protecting the wearer from the corrupting influence of the outside world, as you seem to suggest". This wasn't what I meant to imply. I was thinking more along the lines of what Jim stated about nondualism. I don't see the komuso as hiding persay, but I don't see why their was a need for separating oneself from the 'commoner' to the degree of wearing the basket. I understand the concept of a uniform and its hierarchical role, but the spiritual reasoning for the basket still doesn't quite seem strong enough. (Myself, I am cynical, and applying Occam's Razor I arrive at the conclusion that practical considerations (anonymity + freedom of movement) probably drove the issue to a much greater extent than spiritual ones.."
I have no doubt that people both then and now take it very seriously, it's not them that I am questioning though. I am more questioning the powers that be at that time (not that they can answer). If anonymity was their goal as to be able to travel freely and spy for the government, they would have had to come up with a great "spiritual" reason for it to convince the dedicated players, which wouldn't have been to difficult because they were/are dedicated. I see more issues of it being based in group identification, anonymity, and a need to differentiate themselves from past komoso to establish their image. Thanks for all of the friendly and interesting discussion. Of course these are just some of my ideas, that are always open for some changing in the right direction. I see more issues of it being based in group identification, anonymity, and a need to differentiate themselves from past komoso to establish their image. "Perhaps this removal of individual identity (even if it does not remove your group identity) helps enable you in moving into a more non-personal realm, withdrawing your energy from sustaining your pretense as an individual character." I understand your points Justin of it being a part of the training system, but I can't see why there is a need for a more non-personal realm to begin with? The non-personal realm I referred to is not one which is to be created. It is a level of existence which is always here. I am suggesting that this could be used as a training method for learning to "dwell" in that "realm", so to speak, or to phrase it another way, to become aware of that reality (not that it is a separate reality), or, that "aspect of how things are". We have a habit of dwelling in the relative level of self, investing our energy in the mind structures we use to defend ourselves, interact, attract and repel, and so on. And we invest identity in that structure, believing even that that is "me". Retreating away from human contact (e.g. meditation retreat as is common in Buddhist training) is a way to give us the opportunity to disengage those processes, as a part of the process of awakening. I believe the tengai may have had the potential to function as a tool towards this end, enabling a kind of retreat, even among people. Weren't they supposed to in essence be dedicated songs for people in return for alms (during takuhatsu that is), then why is there a need for the distance between? I believe it is more or less the "person structure" (or at least the way that is held), i.e. one's idea of oneself, which is actually the thing which creates the distance (in this case between the trainee and the alms-giver), maintaining the apparent subject-object division. At the level of "non-self", there is no boundary between them. And it is this level (you could say level of realisation) which the komuso were supposedly seeking. After all, they were "monks of nothingness". The "nothingness" is referring to the reality of non-separateness between subject and object. So at a superficial level, the tengai may seem to be creating some distance. But the superficial distance which can be relieved by removing the tengai, is not the distance which the tengai aims to remove. "The tengai covered the entire head of the komusô, and not only signified his non-attachment to identity or ego, but allowed him to remain silent as much as possible. In answer to questions of his destination, the komusô replied, "the one place of non-dwelling" (一所不住, issho fujû), or "Whatever direction or quarter". Questions as to his name or identity were to be answered only with the name of his temple and his religious name, or with the question "What can you ask of one who consists of voidness wrapped up in the form of a body, and who carries the shakuhachi of infinite emptiness?". Further inquiries were to be met by backing away and waving his flute at those asking the questions." The answers to the questions give the speaker himself (the komuso) something profound to contemplate. Also, they are pretty good conversation killers! Idle chatter is generally distracting to intense meditation training/retreat, so, if a komuso were to really stick to this advice, they could maintain a very diligent spiritual lifestyle, not unlike a retreat, or "open retreat" situation. To put it another way, I could suggest that the "commoner", that "mundane person" whom he needs separating from, is actually himself. Or, you could say, his "ignorance". I have no doubt that people both then and now take it very seriously, it's not them that I am questioning though. I am more questioning the powers that be at that time (not that they can answer). If anonymity was their goal as to be able to travel freely and spy for the government, they would have had to come up with a great "spiritual" reason for it to convince the dedicated players, which wouldn't have been to difficult because they were/are dedicated. Would it not be fair to guess that the spies were in the great minority? I have also been told that the spies were actually entirely separate from the "genuine" komuso. Does anyone have any information about this? Has anyone heard of "Shinobu-ryu"? Apparently they also had a totally different repertoire. I would love to hear if anyone has any sources on this information. Just to clarify, when I talk about anonymity I don't mean for the purposes of spying. I'm sure this went on to some extent, but mostly I mean anonymity for the benefit of the komuso themselves. For example, the guaranteed anonymity must have been very attractive to men (e.g. soldiers gradually being rendered irrelevant by the peace of the Edo period) who wanted to "disappear" and live out their days protected from their pasts. The Fuke-shu itself must have found it very convenient to be able to run messages and people back and forth between temples without anyone else knowing what was going on. And then you have the bottom-feeders who would heavy donations out of one town before moving on to the next; anonymity is obviously useful to folks like that. I know nothing on this subject, but it seems that the tengai is a great way to keep yourself isolated but let you also be amongst the people. It is in a way, a way to keep yourself in your own little world inside of the tengai. It could be a way of closing a door to the outside world letting you meditate while playing. Very interesting topic! One thing i was thinking- rather than looking from the komuso's viewpoint, perhaps it may be good to look from the point of view of the givers in takuhatsu. If you Google Image Takuhatsu or 托鉢　most of the pics will show monks wearing kasa that do obscure their faces. from a layman's viewpoint, the gift of alms (and resulting merit) is a gift not to an individual beggar, but to the buddha/dharma/sangha. perhaps the obscuring of the face, taken to extreme in the tengai, is more to promote that idea, the "identity" of the nameless, faceless monk basically becomes just a vehicle to receive the giving. In a lecture at Princeton, Riley Lee pointed out the very valid fact that takuhatsu-doing monks don't necessarily even need the alms- they are providing a service for the laypeople, an opportunity to GIVE. I may have to make or purchase one of these. It would make it a lot eaiser to concentrate on playing/ meditating this way. Of course, my meditation needs a lot of work yet. Stan Richardson commented that it is useful to stop wind interference at the blowing edge. this would especially apply to long delicate notes. Perhaps it also acts like an umbrella, keeping light rain off your playing. Regarding anonymity , you would only be anonymous to the observer, not vice versa, but it may be of use, like a mask. I think, rather than give the player a sense of anonymity it may serve well to give the player a good reflection of ego rising thoughts from which they may then contemplate. It is one thing to discuss ego subjection, but the direct experience of that situation when the ego conditioning rises in full colours is the opportunity to contemplate one's condition. This may be a useful tool. How do I think and act when I am anonymous. Like some of today's email groups. We can be virtually anonymous, what effect does this have on our thoughts, speech and actions ? There may be historical relationships that we can no longer replicate and so not completely understand its purpose. Though like so many things, beauty is in the eye of the beholder. I have an interesting and also frustrating , at times, situation, in that I am blind. So I often do not know who I am talking to, a kind of anonymity. I respond to words and sound rather than 'looks'. I like to play in some public locations, not that I wish to entertain, rather these locations provide me with interesting acoustical reflections, but people pass by, some stop to listen, i don't see their expressions to my playing though some comment very positively, I have never had a negative comment. But there is this particular kind of anonymity where it is about the sound, not about me. But this is a useful way to study my own ego and my relationship with it. I hear the footsteps of people approaching, what are my responses, fears, am I wanting people to like what I am playing, or is my concentration with my breath. Before shooting off to the work in the fields, I will just add a little thing here. However, if you look at books with drawings published in Edo period Japan, the tengai did most of the time not have the shape that we know today. It was only by the end of the Edo period they came to cover the whole face as much as we know them to. First they were just straw 'hats' in the shape we see used by other Buddhist monks when begging for alms. Then they get deeper and deeper. When I visited the person with the huge Edo period shakuhachi collection that I posted a picture of a couple of week ago - not only did I have the joy of playing such a collection of Edo period shakuahchi - but he had the whole house full of shakuhachi related things that were on desplay. One interesting thing he had done was to photocopy all the drawings of komuso that he could find (and probably exist) and put them up according to the years they were drawn or published. Very interested and informative. I am sorry I have to dig too long ino my notes if I were to tell you when the first drawing of a tengai covering the whole face was published. I know this doesn't add to the historical facts about tengai. But I thought it was worth having in the discussion. I found it interesting that the whole aspect of hiding the identity came late during the Edo period. It gives some food for thought anyway. Before ending my fieldwork stay in Japan I went to Tottori where my grandmother's family originated from because there was a 'parade of komuso' I was invited to participate in. Simura was with me because he by chance had a gig in Tottori the same weekend. We went to visit the sites where my grandmother's family had lived. There was a museum where there in the cellar was a library of all the books and writings the family had left. It showed that this family was one of the families in Japan that had left most writings from the Edo period. They are mostly reports from the check points, household calculations, which punishments were given etc. Simura and I were taken through a door after we had stepped on some gluey stuff on the floor and had dust taken of our clothes. When we came into this huge room with writings dating from the 15th century and up - Simura and I looked at each other said simultaneously: 'Are there any reports on komuso?' The guy who were taking care of this collection said. 'Yes, there are lots of description of komuso and their papers issued from Myoanji'. However, if you look at books with drawings published in Edo period Japan, the tengai did most of the time not have the shape that we know today. It was only by the end of the Edo period they came to cover the whole face as much as we know them to. First they were just straw 'hats' in the shape we see used by other Buddhist monks when begging for alms. Then they get deeper and deeper. The tengai is an isolation booth for the ego. It leaves the unborn unfettered to just express itself in the music. This MAY have been true in Edo-period Japan (we can't see into the souls of komuso), but clearly these days wearing a tengai is a sign of differentness, individuality, i.e. ego -- even if the only audience for your statement is yourself (you always see yourself through the eyes of our culture). 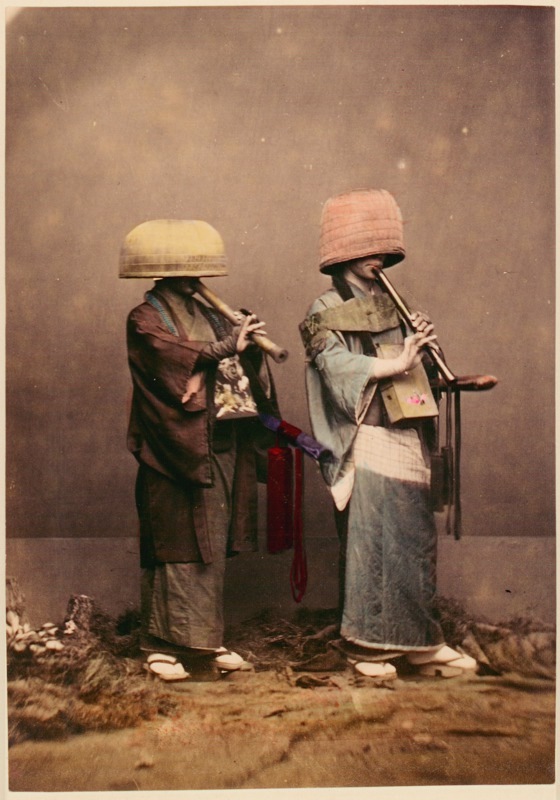 I can understand wearing komuso clothes as part of a historic show-and-tell performance, or in a sort of fun Renaissance Fair-like situation (even a World Shakuhachi Festival), but I have trouble seeing the tengai as a spiritual tool to mitigate the constant tug of ego -- quite the reverse. The Dharmacrafts catalog never saved a soul from rebirth. Stated another way, as a very personal fashion opinion: a modern Japanese person wearing a tengai looks pretty silly; a Westerner wearing a tengai looks goofy as hell. Wow, a lot of different viewpoints and a lot of information to digest. Food for thought, thanks. Was it really used as a training aid? Some people have mentioned they may feel like they are in their own world and are able to concentrate on their music/self better with it on, but actually I find the practice of performing in front of people with all eyes on you a very eye opening, 100% concentration needed, slap in the face wake up call sometimes, type of practice that is much more intensly insightful than trying to block out the world or hide in the dark at home and practice. Don't get me wrong, playing in the dark with a dim light is really a cool feeling, but there are probably many other better training aids. I heard a saying before something along the lines of, anyone can find peace in the mountains, finding piece on a city subway is a much better test. So up until the end of the Edo period they were just fine with playing in the more shallower style tengai. Why was it that they felt that a deeper hat would somehow be more spiritual? They had been playing mindfully for a very long time up until the change was called for. So it leads me to believe that there were other ulterior motives for the change other than deepening the players spirituality. "This MAY have been true in Edo-period Japan (we can't see into the souls of komuso), but clearly these days wearing a tengai is a sign of differentness, individuality, i.e. ego -- even if the only audience for your statement is yourself (you always see yourself through the eyes of our culture). " And given the small numbers of komuso that would be in any given town in Japan in past, wouldn't this have signified the similar attitudes of individuality etc.? It could have been used as a status symbol. If you saw someone wearing a tengai you would know they were komuso. Instead of a regular shakuhachi player. If you were wearing identical uniforms with the face completely covered, how could you be individual? Did the Komuso improvise, or did they play the same pieces the same way as the other komuso? Growing up in NYC I once vacationed on a 40 acre spread high in the Adirondacks owned by an elderly Englishman with Sufi leanings. It was the first time I ever heard complete silence - very unnerving. I was warned about the bears that roamed the mountain, but that didn’t keep me from getting lost for several anxious hours in the surrounding forest. When chopping firewood I was struck in the forehead by a chunk of flying oak that nearly rendered me unconscious. And I lost an oar while rowing in the middle of Indian Lake. Through all this I had been somewhat consoled by the wind blowing through the pines, which sounded to me like the traffic on the West Side Highway. But it wasn’t until I arrived home and took the A train that I found peace of mind. I am completely the opposite. I love the woods and get unnerved in the city. Go figure. but actually I find the practice of performing in front of people with all eyes on you a very eye opening, 100% concentration needed, slap in the face wake up call sometimes, type of practice that is much more intensly insightful than trying to block out the world or hide in the dark at home and practice. Well said, Josh. The rigors of public performance will naturally push one into being more disciplined and focused than they normally are. Sometimes spiritual progress isn't so much about theories and mystical experiences as it is just about changing your view of yourself and others through hard work. None of this takes anything away from the Tengai experience. It's just another method. Music as a living mandala. The Dharmacrafts catalog never saved a soul from rebirth. Anything can be used as a spiritual tool, even the sound of West Side traffic.